From Manila Ninoy Aquino International Airport to Bayleaf Intramuros Hotel, click here to visit hotel’s ‘Transportation Service’ page. The hotel is located within 8 kilometer radius from the airport and Manila business district. Travel time from the airport is 30-45 minutes. We also highly recommend to take Uber or Grab Taxi from the airport to the hotel. The ordinary taxi fare from the airport to Bayleaf hotel is around 250 PHP to 300 PHP (or 5 USD to 6 USD), while from hotel to university the taxi fare is around 100 PHP to 150 PHP (or 2 USD to 3 USD). The venues are Mini Auditorium (for the conference) and AVR Room (for the workshop) located at 9th floor of the Technology Building (no. 14 as stated in the campus map), Far Eastern University, Manila. One may also take the LRT (Baclaran-Monumento) and alight at Doroteo Jose station. From there, take a Morayta-Gastambide jeep to get off at the gates of FEU. One may also take the LRT 2 (Santolan-Recto) and alight at Recto Station. 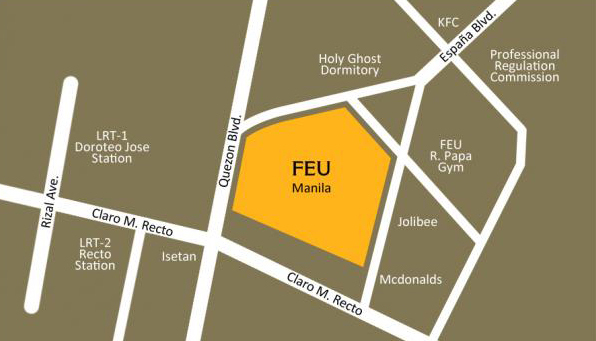 From there, take a Morayta-Gastambide jeep to get off at the gates of FEU. Please inform them that you are one of the participants or attendees of the PhISO Conference at Far Eastern University, Manila to avail discounted corporate room rates. It is imperative that you provide details of your credit card in order to confirm your reservation. If you are coming with families, friends or colleagues, it is better to reserve for a twin room to share the expenses. Moreover, it is important to advise the reservation officer fourteen (14) days prior to the expected date of your arrival to avoid cancellation charges. Click here for the hotel’s website. You can change your money to Philippine Peso at any M. Lhuillier, Palawan Pawnshop branches and to several money changer outlets outside the airport. For safety and security tips, click Megacitizens for your guidance.